We've got rainbow fluffies in your favorite color combinations! These are so popular because they match everything. 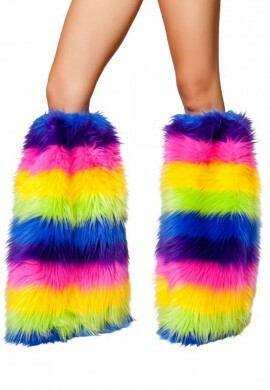 We carry everything from bright neon rainbow fluffy leg warmers to soft pastel rainbow fluffies. As you probably already know, RaveReady has more fluffs in stock than anyone else in the world and only carries the highest quality brands. Most of our leg warmers have a tapered leg so they can cover your most comfortable pair of dancing shoes. Rainbow Blends There is 1 product.